“After playing the jaw harp for 10 minutes, the vibration goes through your mouth to your skull and your whole body resonates, getting into some kind of ecstatic euphoria. It feels like I am part of a shamanic ritual of an ancient civilization. This instrument has been around for thousands of years and many cultures embraced its sound in various ways”, says Marios during one of our hikes on Ymittos mountain, overlooking the city of Athens. We have been friends for a long time and together we created the live music performance “Music For Jaw Harp”, playing at many venues around Greece, but also in Berlin and recently in Tel Aviv. “When I was 12 years old, I asked my dad to get me a Jaw Harp, mesmerized by the score of “For a Few Dollars More”, composed by Ennio Morricone. Today, in my late 30s I own 200 of them from various makers around the world, most of whom by the way live in Siberia. Each one makes a different sound and has a unique shape. Here are my top 3: an Italian “maranzanno” with a trebly sound and fast attack for fast playing, a Norwegian “muunharpa” with a bassy sound, ideal for accompanying, in a band situation and finally a “khomus” from Yakutia with the most powerful bass sound and rich overtones.” The jaw harp can either lead or accompany rhythmically. The resonating body of the instrument is the mouth cavity and as a result, the breath, the move of the tongue and the diaphragm can be noticed during the performance. In 2015 Marios released the album “Music For Jaw Harp” inspired by the great minimalists Steve Reich and Terry Riley. The main track was created by layering different harps, arranging them according to a score, which can be found inside the booklet that comes along. It was a way of overcoming the single-note nature of the instrument. For the rest of the album, Marios used percussion instruments and synthesizers, showing the collaborative potential of the harp. It was a pleasant surprise when we heard one of the tracks aired on the award-winning online radio station NTS of London, famous for discovering exciting new talents and celebrating experimental music. After the album release, I collaborated with Marios, co-arranging the songs again for a live show, adding live electronics, analog synthesizers and vintage keyboards. Together, through rehearsals, shows and many hours of trying new ideas, we tried to explore the capabilities of the harp and met many people that got interested in the instrument and the project. I remember in Thessaloniki, someone from the audience got onstage and jammed with us! “I definitely became better at playing, but also realized the potential of this thing that fits in my pocket”, Marios says when asked to compare himself today to when he started playing all those years ago. While watching the movie “The Strange Sound Of Happiness”, I resonated with Diego’s deep love for the harp and totally agreed with the sensation that evokes to the body and the mind. I was a little jealous of his wonderful trip and him meeting all these amazing people, who are parts of the jaw harp community. Go watch it, and you will definitely want to grab one yourselves after. You might even have one of his wonderful dreams! *”The Strange Sound of Happiness” (2018) by Diego Pascal Panarello is the opening film of IN-EDIT 2019. The screening will be followed by a QnA with the director as well as a jaw harp performance by him. Later there will be a party with Dj Oscar Smit. The host for this packed night will be none other than Mr Extravaganza. Get your tickets by clinking on this link. 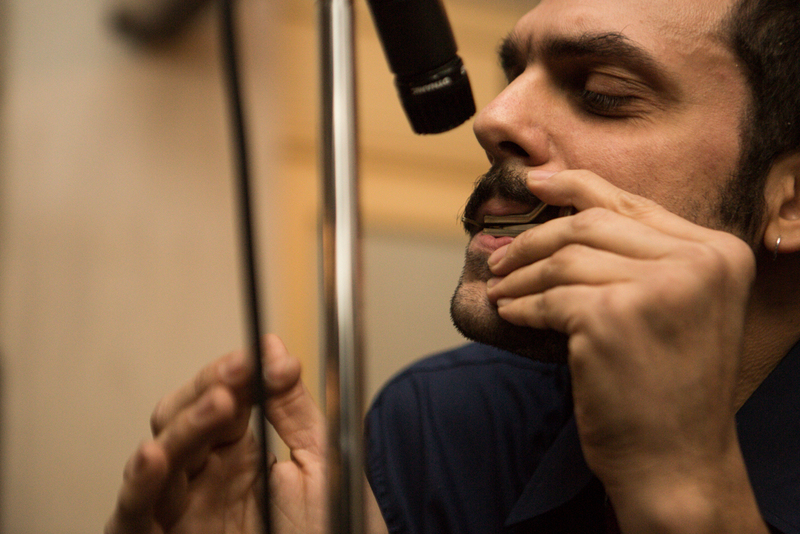 **Featured image: Marios Visvikis is performing on his favorite instrument, the jaw harp. Photo by Nick Zarago.